Conversations with Penn and Teller: 35 years of magic & BS! In the sumptuous surrounds of IndigO2, the stage is set with just three chairs, a bench and a table. With no introduction, for they need none, the pair arrive on stage and launch into their first trick of the night. What initially appears to be a simple card trick, delivered with Penn & Teller’s usual flair of showmanship, soon becomes the type of magic that the duo are famous for, ending with Penn having his hand stabbed by Teller. The evening continues mainly with them in conversation (as the title suggests) with their guest for the evening, Jonathan Ross. It is very soon apparent that their stage personas are simply an exaggeration of their own personalities, with Penn Jillette leading much of the conversation in his booming showman voice, while Raymond Teller is often happy to sit back, only occasionally treating us to his softly spoken but powerful sense of humour. The evening is interesting for those wanting to know more about the men behind the magic act, but don’t go along expecting to see loads of tricks. The stories are interspersed with some displays, but it is essentially a conversation piece. There is an interesting section on the modernity of their shows which both parties said was down to the fact that they respect the audience’s intelligence and want to break down the barriers between the magician and the audience by explaining how they were doing tricks. This was amply demonstrated by an explanation of the cup and ball trick, which they performed in clear beakers, but was done with such speed and skill that it still looked magic to me. After working together for 37 years now, it is interesting to hear about the early beginnings. Penn hated the lies and fakery of magic as a youngster, until he happened upon a young Latin teacher called Teller performing a trick in a library basement. History was born, and the pair have now created one of the world’s leading magic shows, with their 10 year residency at Las Vegas’ Rio Hotel and Casino alongside their regular world tours and TV appearances. They shared some ideas for tricks they are currently working on, and discussed plans for a special edition of their acclaimed Showtime television series, Bullsh*t!, in which they debunk popular myths and uncover the tricks used to manipulate the public. The special edition will focus on their own mistakes and tricks, and promises to be hugely entertaining, providing it gets the final go-ahead. There was also a particularly meaningful discussion on their opinion of Faith Healers and Mediums, which were the focus of a Bullsh*t! episode. Penn in particular could not hide his dislike of the way such things manipulate grief and the precious memories of the recently deceased. On a subject so contentious, it was refreshing to hear someone so public be completely open and honest about the pain this can cause. 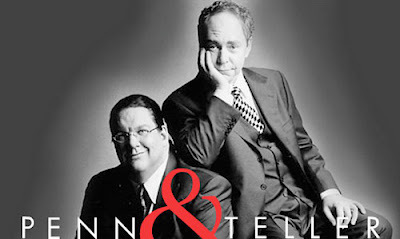 Overall, Conversations with Penn & Teller: 35 Years of Magic & BS! is an interesting, entertaining and informative night, but one I felt could benefit from a touch more of the magic they are so famous for. Conversations with Penn & Teller: 35 Years of Magic & BS! plays at the IndigO2 on Wednesay 7 and Thursday 8 December. Tickets are currently sold out, but check www.theo2.co.uk in case of returns.